There’s a raptor on my head! 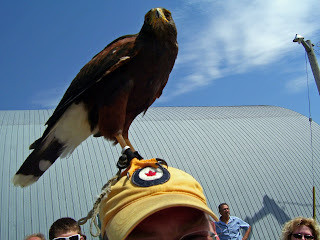 The photo , (a rather good self portrait I think) is of me and my new friend Woody, he’s a Harris hawk, and part of the Canadian Raptor Conservatory’s birds of prey show, that took place last weekend (Aug 10 ) at the Perth Garlic Festival, lots of fun and lots of garlic, dam I love that stuff. I even picked up garlic chocolate fudge! Yumm! I kid you not it was really good , had chile peppers in it to give it a kick, Fantastic! You know a lot of people I know would turn their nose up at something like that , my self I usually give it a go, hey you never know! Life’s lesson here? Give it a try you never know, thats how I found out I like garlic ice cream! Dodged the bullet on that one! Well ,now , I guess I did dodge the bullet on that one! This past Sunday I went to church, not just any church but the one I will be getting married in . Other than weddings and funereal, this is only the second time in the last five years that I was in a church for a Sunday service. I am not a regular. You see I have to go meet the minister that will be marring us, as I am an atheist, I was a bit nervous. As it was not out side the realm of possibility that she could refuse to marry us , sounds silly but that is her right. Well all seamed to be going well until I was asked if I believed in god, I thought I was screwed . Well I told her I was not sure about a supreme power . We chatted a bit , I wont bore you with the details, but what she said was pretty cool. I love no pressure sales! I have to say she is a very cool and understanding minister, I think I could have some fun talks with her. Its funny how a little bit of respect goes a long way. Well that one more thing checked off the wedding to do list, and only 90 days to do ! Well today should prove to be an interesting day, I get to meet the minster that will be marring me and my girl. I will be on my best behavior, I will be respectful of her option , I just hope that she will be as respectful of my option . You see I am an atheist , I have a rant on god and logic that I will post at a later date, but today just might be an interesting day!